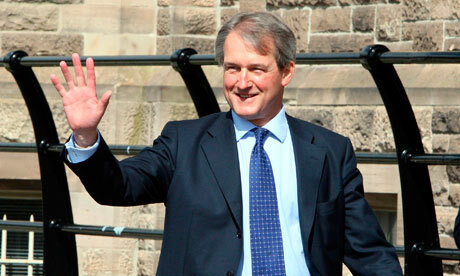 Owen Paterson recently took part in a 1,000-mile horse race across Mongolia. It is hardly the resume item you would expect to see on a Northern Ireland secretary’s bio, but Paterson, 55, is hardly the conventional type of politician. He rarely beats about the bush even when on the defensive, which his government was last month after it announced that it would not hold a new public inquiry into the Pat Finucane murder back in 1989. Finucane’s widow Geraldine essentially stormed out after British Prime Minister David Cameron said no to the public inquiry into a murder for which the order, many believe, came from the very top of the British government back in 1989. Over breakfast in Manhattan last week, Paterson says he accepts the finding of earlier tribunals that there was collusion -- a chilling admission in itself when you think about it -- but says a new public inquiry would not clear up the matter. He points out that many of the original actors have now died, and that a lengthy but incomplete public inquiry would not necessarily help bring about the truth. The Finucane family finds this unsatisfactory. Paterson says he is sorry, but that is what his government will do. He points out that good faith has been established by the Saville Inquiry, widely praised for its finding on Bloody Sunday, and that his government is keen as anyone to put the murky past behind them in Northern Ireland. Bottom line, however, is we can hardly expect the full truth anytime soon on how high up the Finucane murder order came from. Paterson is refreshingly blunt for a politician, and greatly favors a bigger focus on economic issues in Northern Ireland and the future role he may play. He notes the fact that 70% of the Northern Irish workforce is dependent on government for their jobs. It is an insane figure, and Paterson has made no bones about making his own strong feelings on the topic known. Paterson says that corporation tax reduction in the North, such as the rate that applies in the Irish Republic, is a key aim in order to attract more investment. He had recently saved the bacon of the vital U.S. air link from Belfast to Newark after Continental threatened to pull out. Continental were set to withdraw because of high passenger taxes, but Paterson persuaded his friend George Osborne, the chancellor of the Exchequer, to cut a special deal. “Continental were quite clear on the air passenger -- as long as it stayed at £60 it was costing them millions every year. They made it clear they couldn’t go on indefinitely absorbing the costs of the flight,” Paterson said. Paterson succeeded in cutting it to £12, thereby preserving a vital link. He is also not afraid to take on politicians’ pay. Paterson also wants to confront what he calls “double jobbing” by some politicians who hold seats in both Westminster and the Northern Ireland Assembly. He told the Conservative Party conference, "I don't believe anybody can be a full-time MP and a full-time Assembly Member, and so I will give you this commitment today -- by agreement if possible, but by law if necessary -- we will end double-jobbing." On the dissident IRA threat, Paterson points out that they continue to have very little popular support. Their latest bombings in Derry, apparently aimed at the fact that the city won the U.K. City of Culture award for 2013, brought out citizens on the street protesting against the dissidents. "It is quite extraordinary when you think how that city is coming together united behind the City of Culture coming along soon, that this tiny number of unrepresented people can do such a crazily reckless thing,” Paterson said. He has put together another package of $300 million to tackle the continuing dissident threat. Paterson knows there is much work to be done before Northern Ireland can truly be a normal society, but his ability to take on some sacred cows just might move that process along.